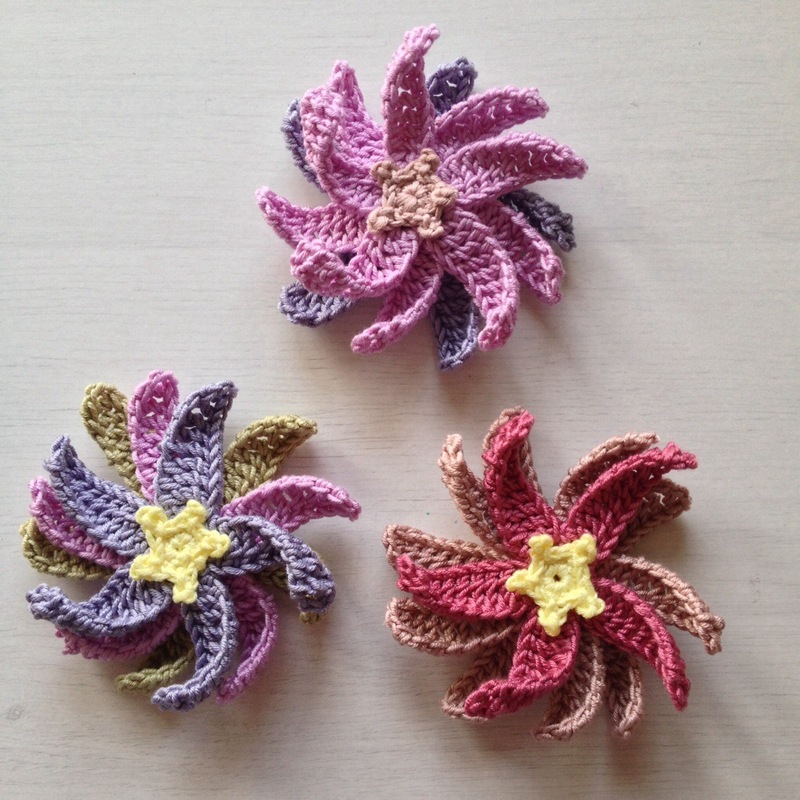 My flower brooches in Simply Crochet! I came home late last night from London frozen to the bone after a three hour Jack the Ripper tour in the East End, a long wait for the bus then a frozen car windscreen which I needed to de-ice. My feet felt like two big ice cubes! 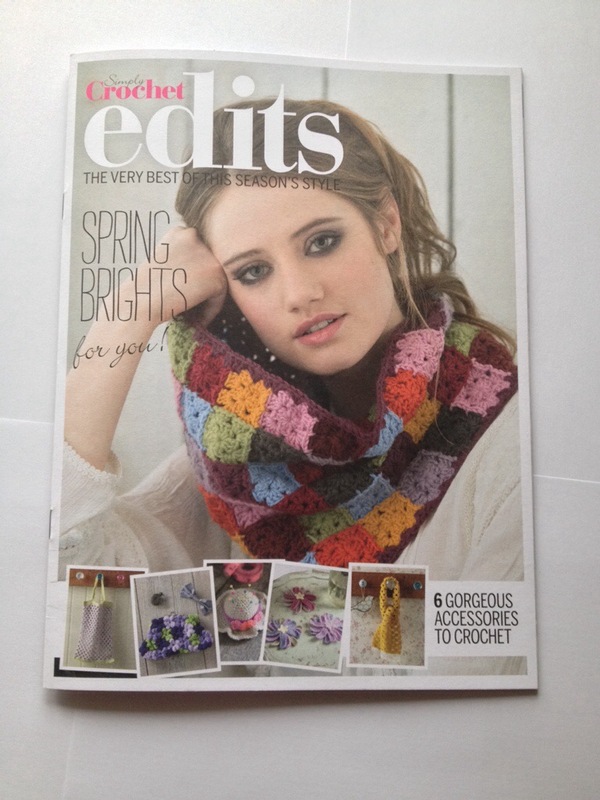 But there in a prominent place propped up on the stairs was my new issue (16) of Simply Crochet. All thoughts of feeling cold vanished! 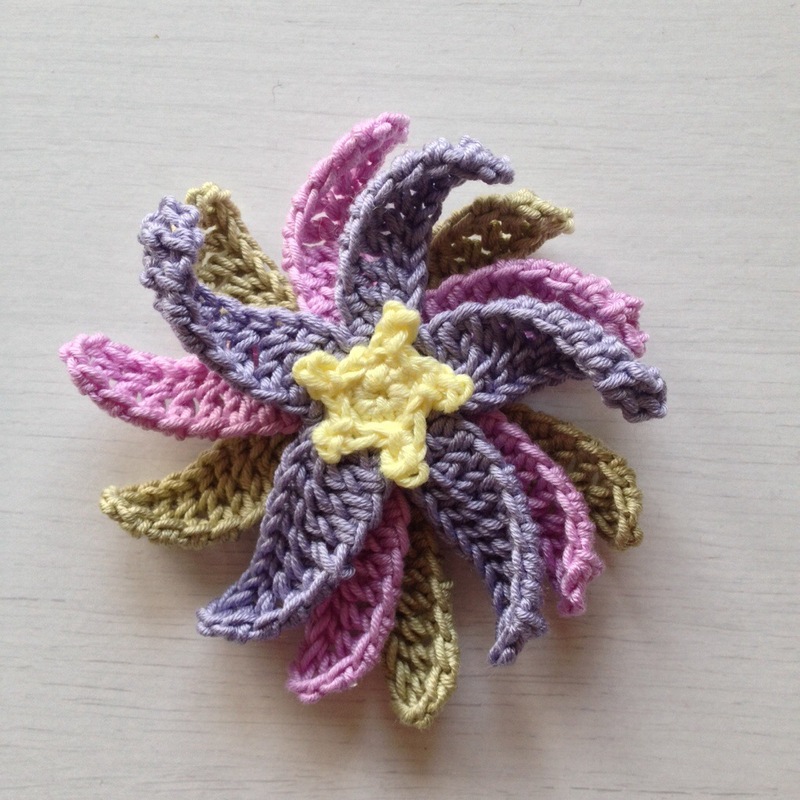 In January I was contacted by Tanya, the Commissioning Editor and asked if I would design a brooch for a Springtime feature in Simply Crochet. You can imagine my surprise and pleasure at being asked, especially as I’ve bought the magazine since it began. 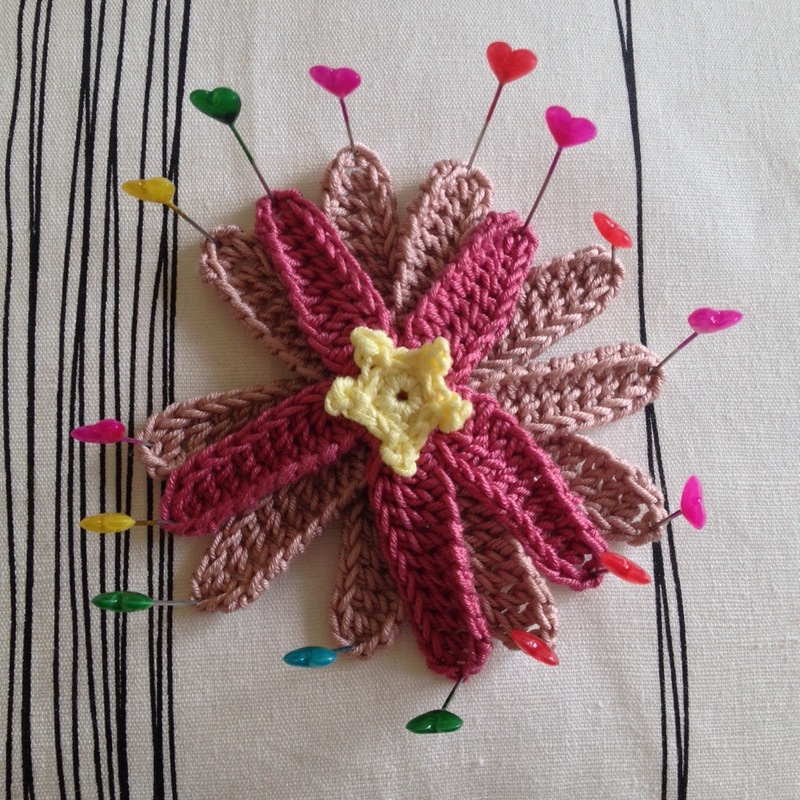 I was sent these lovely balls of cotton and given completely free rein to design whatever kind of brooch I fancied. 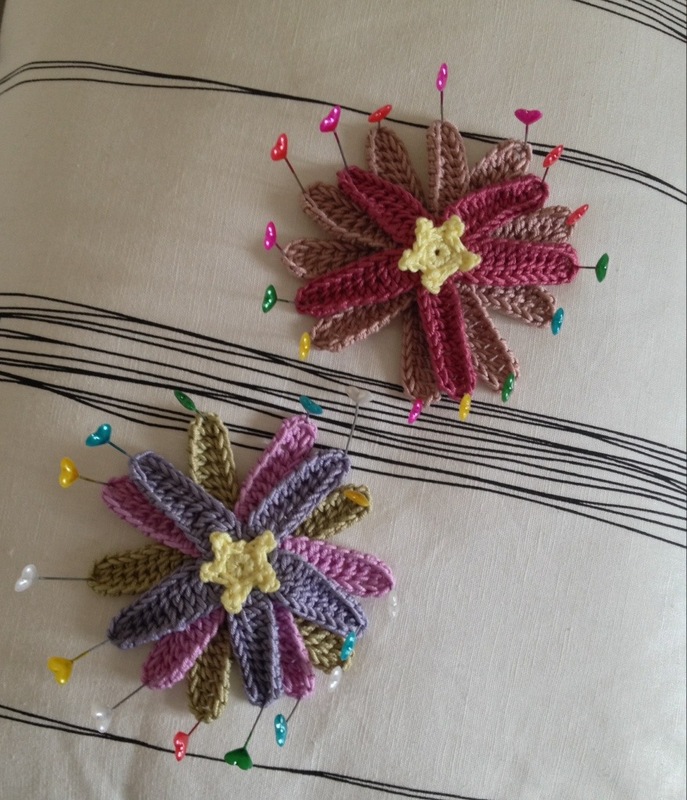 I really enjoyed sitting here in The Little Room playing with different stitches and colour combinations, it was a great way to banish any post-Christmas January blues. 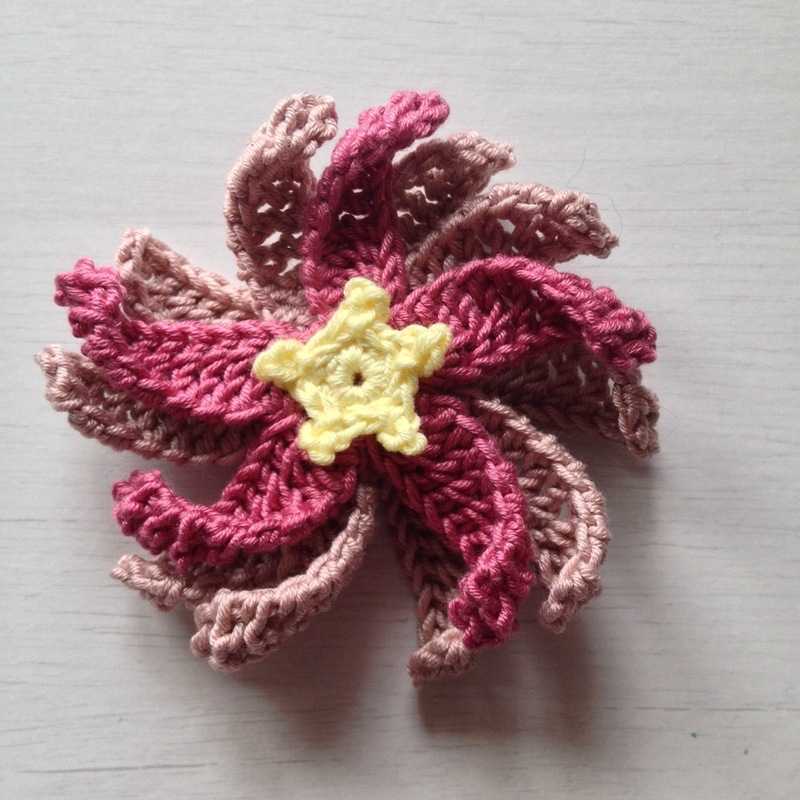 I came up with a curly twirly flower brooch to pin on a bag, to add a bit of pretty. They work well if you pin the petals out (dry) for a little while, as you release them they ping up and curl delightfully around. Alternatively you can block them and leave them flatter as the magazine have done. 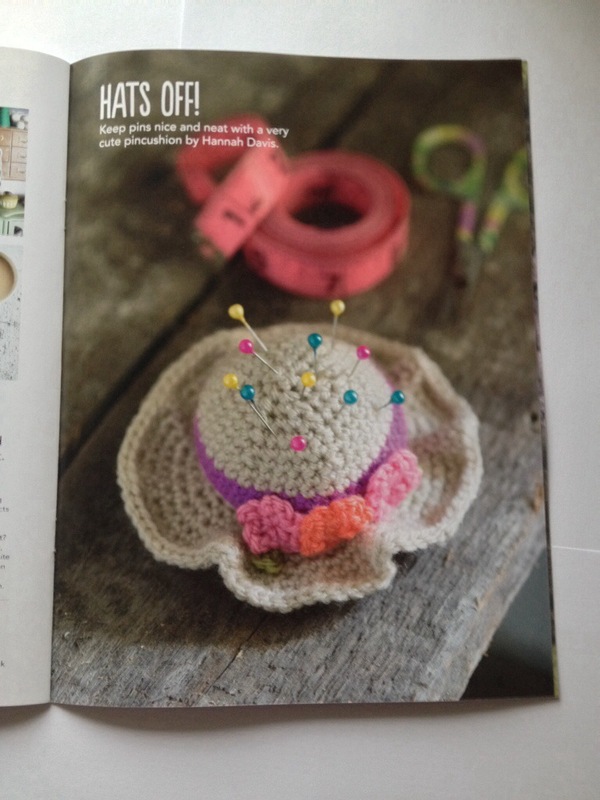 As this would be my first ever published pattern (I’m beaming as I still can’t believe it, I’m sooo happy about this unexpected event) I was a bit nervous that it would be gobbledegook and asked Kate of Greedy for Colour to check it. 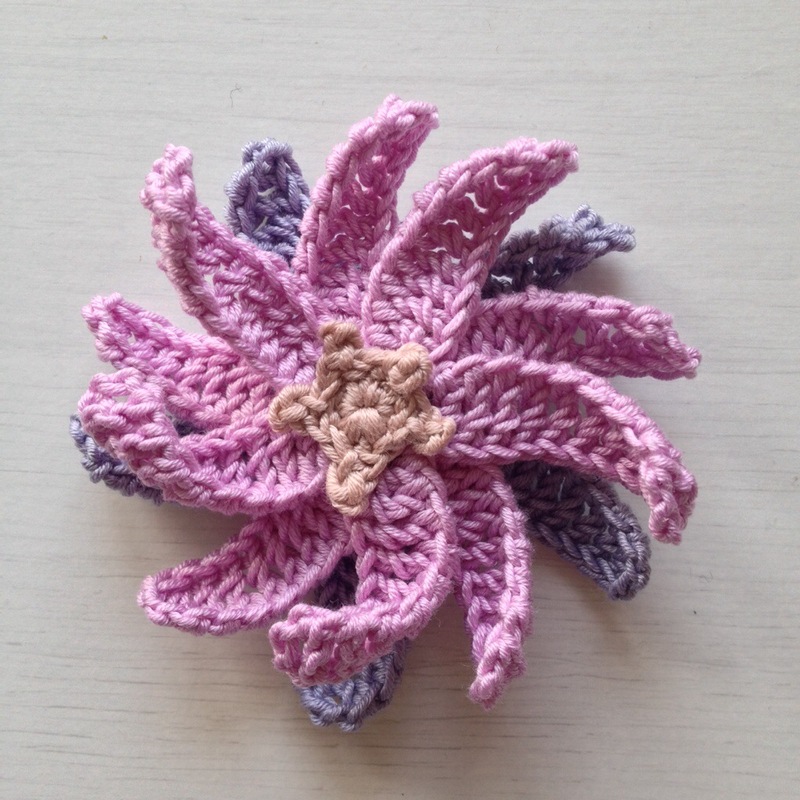 The rush of having someone else, particularly such a crochet clever clogs, test your pattern and come back with a gorgeous version of their own (2 lots of delicate light pink petals on the top, a white set at the bottom and a pale primrose middle) and 100% positive feedback was immense. I had thought I probably shouldn’t show what I designed until the magazine is in the shops or online but today see that others have shown photos and are talking on social media about the feature, so gave myself the go-ahead! It’s way too exciting not to! Ooh on the front cover of the supplement!!!!!!!!! Lovely styling. 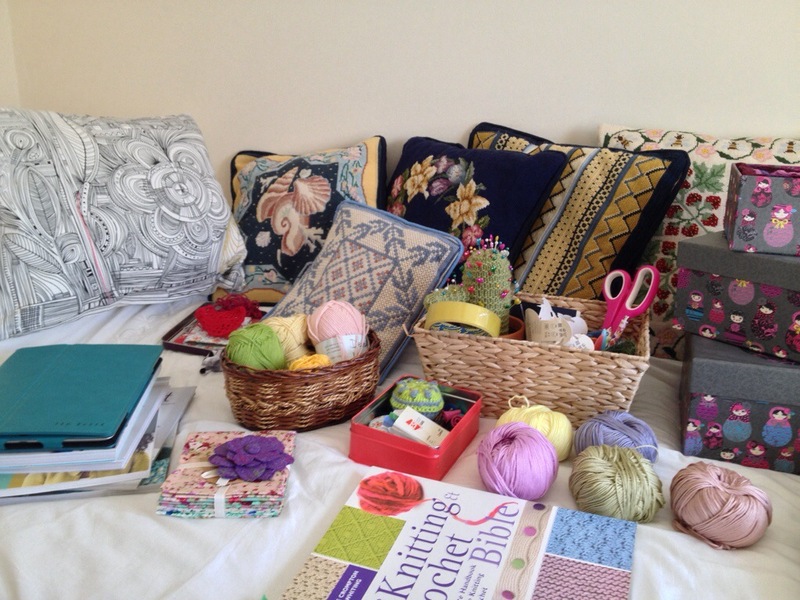 That’s MY crochet, crocheted here in this Little Room in my house! Wooooooo! Boom! 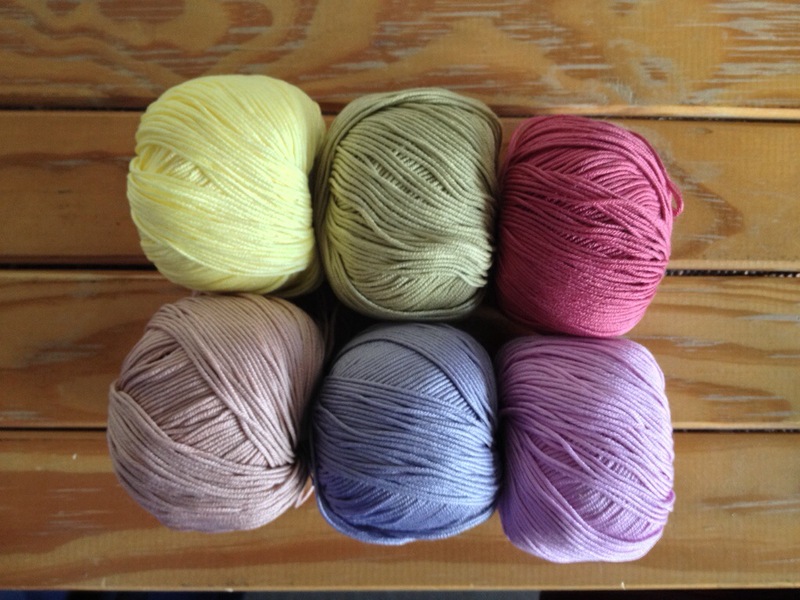 (As Claudia says on GBSB.) 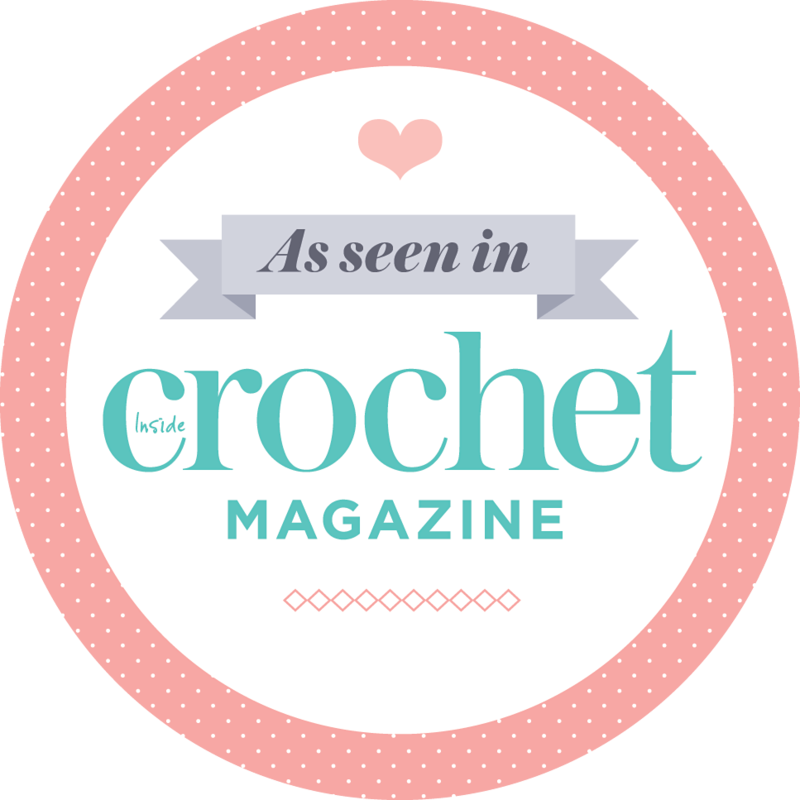 The opposite page has the brooch pattern, a few other photos and bit about my crochet, thoughts on blogging and inspiration. 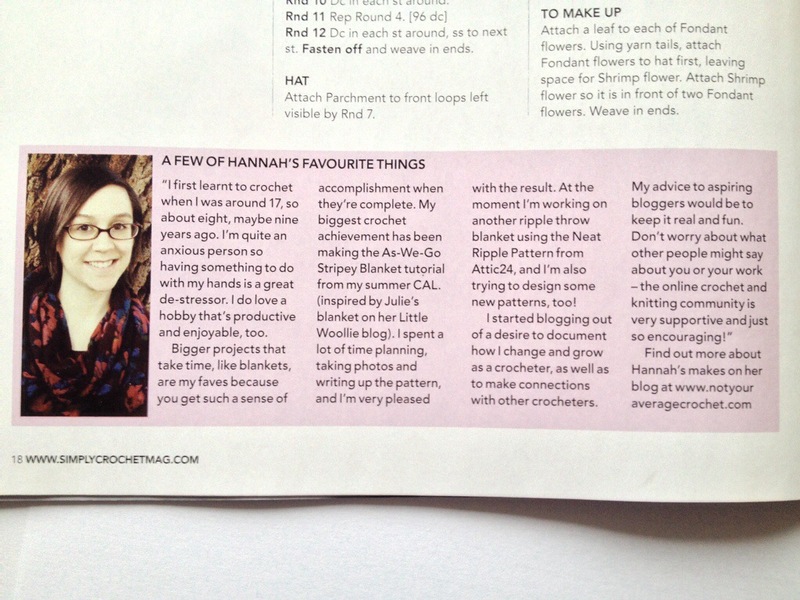 It’s the lovely Hannah from Not Your Average Crochet. 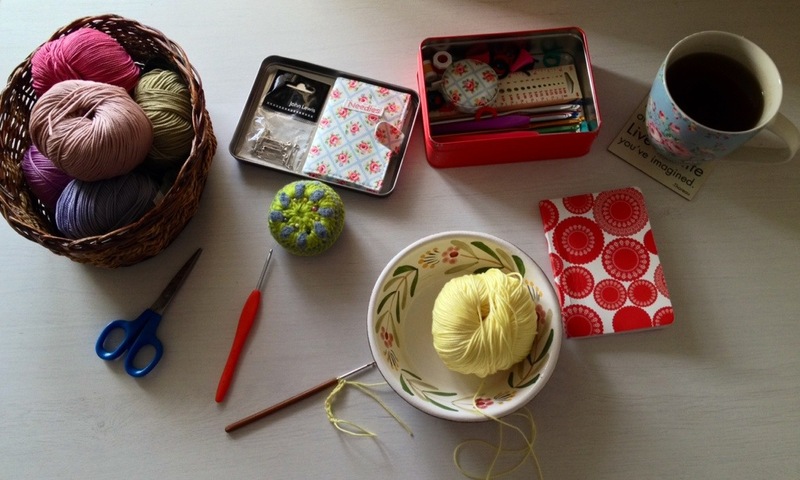 I’m so making this Springtime hat pincushion. Now I’m off for a refreshing glass of wine! Congratulations on being featured Rachel!!!!!!! I’m going to check out Hannah’s blog and most likely subscribe if I like the writing. Thanks so much for the recommendations and kudos to you again. Congrats! 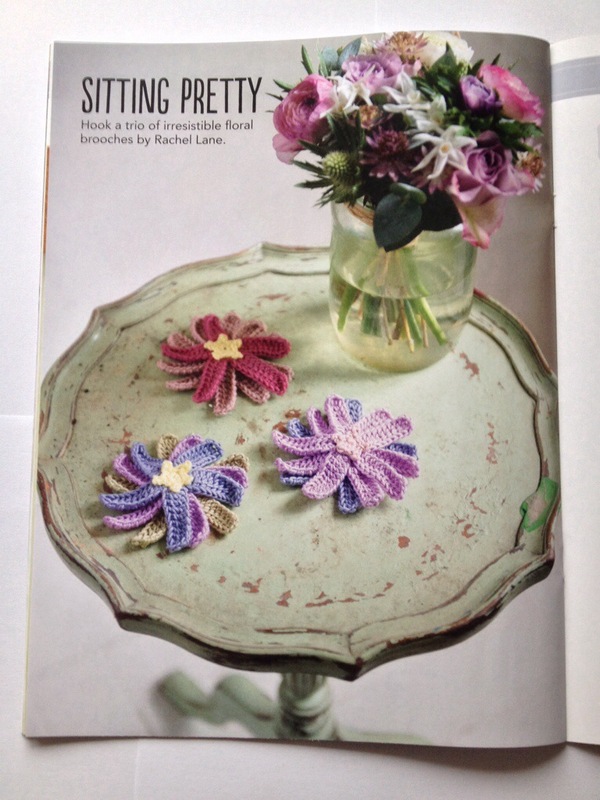 Must be exciting to have your work look back at you from a magazine!!! What a lovely design, well done!